Wearable technology, smart electronic devices that can be worn on your body, are on the rise as they become more affordable and easy to use. The first thing that may come to mind are fitness trackers, connected accessories that you wear on your wrist or around your neck, often challenging you to do your 10,000 steps a day. These fitness trackers were followed by wearables with functionality beyond fitness: the Apple Watch, the now-defunct (on the consumer side) Google Glass, and many more. By 2020, the smart wearable device industry will be worth $34 million. The South has been keeping an eye on the industry and is already branching out past the fitness sector into social issues, health monitoring for clinical trials and athletes, and even agriculture. Memphis, Tennessee, startup Cowlar is going beyond even humans — with a smart wearable collar that helps cows yield more milk while staying healthy. 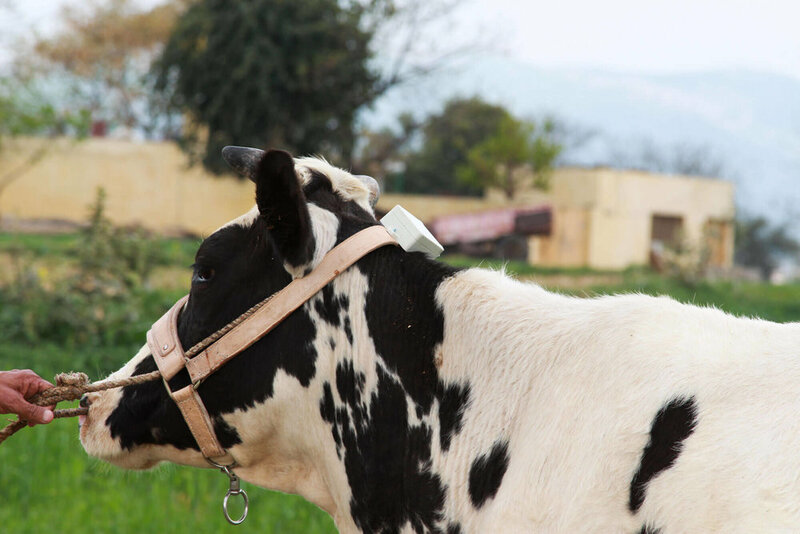 The collar monitors the cows without disrupting their daily routines and alerts farmers of disease symptoms, activity, temperature, and stress factors. According to CEO Umer Adnan, the wearable helps increase dairy output by approximately 15 percent. The collar uses motion sensors to track the cow’s behavior and send it to the farmers to act on. The startup originated in Pakistan and has expanded to Silicon Valley and Memphis. In North Carolina, MVTrak is a startup tackling a major issue in the sports industry with wearable technology: the risk of head injury. Concussions and traumatic brain injuries (TBI) costs upwards of $20 billion per year in medical costs and have been a recent hot-button subject in the medical and sports communities. They can affect everyone from child athletes to pro players and soldiers, with 85 percent going undetected, according to the American College of Sports Medicine. MVTrak’s Tachta wearable device goes around the ear canal, similar to a hearing aid, and captures head motion data, measuring magnitude, force, direction, and frequency of hits with 96 percent accuracy. The device can be easily worn by football, soccer, lacrosse, basketball, and hockey players, plus members of the military, all of whom are at risk for brain injuries. The data funnels into MVTrak’s platform, where coaches (or commanding officers) can track the history of hits and assess solutions for prevention. “We will continue to develop products for monitoring, assessment, and prevention — to make sports safer, our warfighters stronger, and our futures brighter, plus prevent untold hardship and difficulty for victims and their families,” says Heiks. Insurance companies are trying to jump on the prevention wagon as well with the use of wearables. While only 10 percent of American adults own fitness trackers, the number is quickly increasing as new sensors and integrations are released. Fitness trackers like Fitbit can be used to lower your insurance premium and stay on top of your health between checkups. Digital health startup Aces Health is flipping that model on its head. Instead of gathering data from your fitness tracker to inform your insurance company, they are using wearables as a way to help clinical trials stay accurate. A main issue within clinical research is keeping track of the patients’ compliance and their health while participating in trials — they aren’t in the hospital 24/7, after all. “Using an intuitively designed smartphone app and an ecosystem of connected health devices like Fitbits and Bluetooth inhalers, we transform the patient experience to improve adherence and compliance to medical regimens outside the doctor’s office,” says CEO Jordan Spivack. Aces Health’s app connects to health tracking devices to make it easier for the patient to share data with researchers and for researchers to collect data faster. The wearable technology empowers the patient to take control of their chronic condition and gives enough data to the physician to make more personalized health recommendations. It also encourages patient engagement during pharmaceutical trials and gives real-time data to the doctors (all on a HIPAA-compliant basis), increasing the chances of a successful and accurate trial. While the Atlanta startup’s initial focus is clinical-trial compliance, they are looking to expand beyond that into the medical field. “Our mission is to bridge the gap between population health management and technological innovation to make the management of healthcare with a digital platform possible,” says co-founder and president David Heenan. Wearable technology doesn’t only have a place within the health industry, it can also help students stay safe on campuses. After being a victim of assault during her freshman year of college, Annmarie Stockinger partnered with her friend Koby Schmetterling to create a usable, sleek product that could help students alert security personnel in the event of an assault. They founded GoSafely. They dove deep into research to find the best way for students to carry the wearable at all times. Ninety percent of people surveyed said that they carry their keys on them at all times and they stayed away from wi-fi and bluetooth-powered wearables as phones often die or get lost. 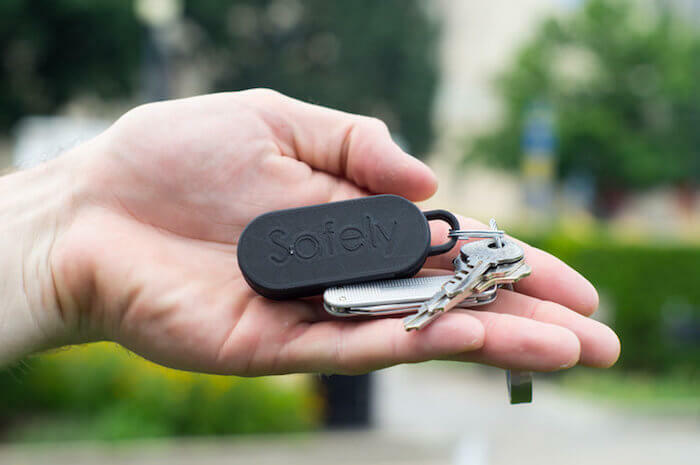 The SafelyTags are small enough to hook up to a keychain or backpack. If a GoSafely user is assaulted (or observes an assault), they depress a button on the device and it sends a signal to nearby security personnel or local authorities with your precise location, within only two feet. Wearable technology can also bring safety to the homeless. After the closure of one of the main homeless shelters in Atlanta recently, the homelessness issue in the city is becoming critical. India Hayes and Anita Jones founded Mini City to solve one of the biggest entry barriers for homeless citizens: the lack of legal documentation. Many don’t have records or IDs to take advantage of basic services, and costs to obtain them can be prohibitive. Mini City’s wearable is physically similar to fitness trackers, but instead of recording health data, it stores encrypted legal identification and records. “Securing an ID can be a daunting task for a segment of our society that is often overlooked — a lack of identification starts to become a much larger issue, rendering individuals unseen in society,” says Hayes. Homelessness costs the city of Atlanta $63 million annually. With a cost of $100 per individual, Mini City’s device and software have the potential to save over $8,000 per person, says Hayes. “You need compassion and constant communication when you are working with indigent communities, but you still need business savviness to have a sustainable tech solution. For social enterprises, neither can falter,” says Hayes. Many of these startups have decided to stay within the South thanks to a constant influx of talent and sense of community native to the area, despite a slow trickle of venture capital compared to other areas. Muriel Vega is the associate editor at Hypepotamus, the leading startup- and technology-focused news publication and community resource in the Southeast. Sign up for the Hypepotamus newsletter and follow them on Facebook, Twitter and Instagram.